so this week I'm spending a bit of time piecing up backings and bindings. Remember my 'floribunda' quilt, the one with a mish-mash of busy bright colour? (see here and here for earlier progress photos). Well, as I was measuring up for the binding, I felt the edges were a little unstable. So I added an extra neutral-ish border which has strengthened things and seems to give a bit of a resting place for the eye. And after some initial uncertainty, I like it! Hehe, instead of rows of flying geese, I think it now looks rather like those iconic bathing boxes at Brighton Beach in Melbourne!
. 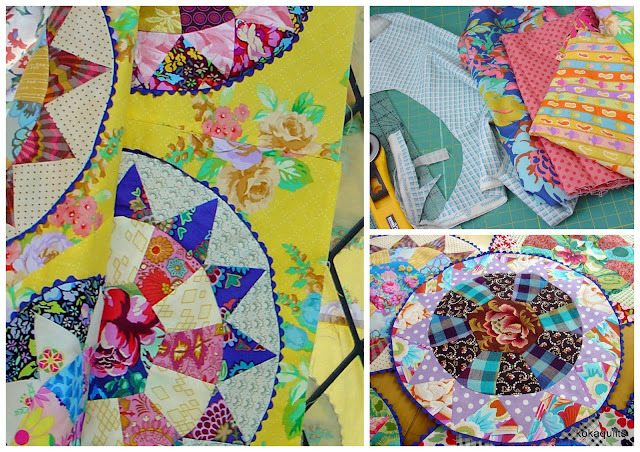 . . now all ready for quilting. And once again, there were lots of inspiring projects shared last time around. 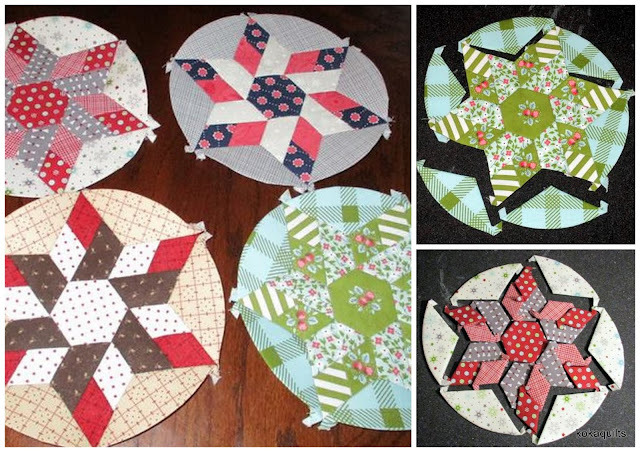 These pretty star blocks made by Karen from Karen'sQuilts...etc caught my eye. She started a new EPP project recently, Sue Daley's 'round we go' (see here for more details). I love that green fabric combo! 3. 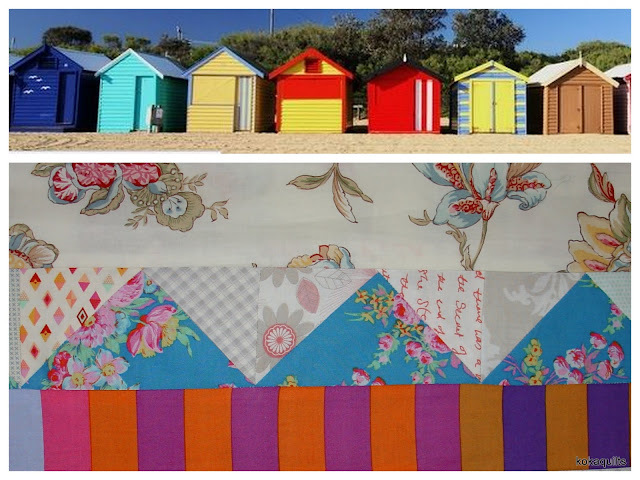 Please comment on a couple of the other Sew, Stitch, Snap, SHARE links - its fun to receive comments from new people, and we are trying to encourage people to read blogs and to keep blogging. Hope you find some new inspiration too! My not so pastel 'vintage comfort' quilt got the extra border treatment today. I'm using Judy Newman's pattern from her new book here and I tossed up for a while about making my version in soft pastels too. But I've seen some other inspiring colour combos over on instgram lately - see here, here, and here . And, I'm a big fan of the modern way Sheena Chapman uses vintage fabrics, see here too, so I decided to be a bit adventurous, à la Sheena! However, the other thing that also determines the direction of most of my projects is what I actually have on hand in my stash at the time. 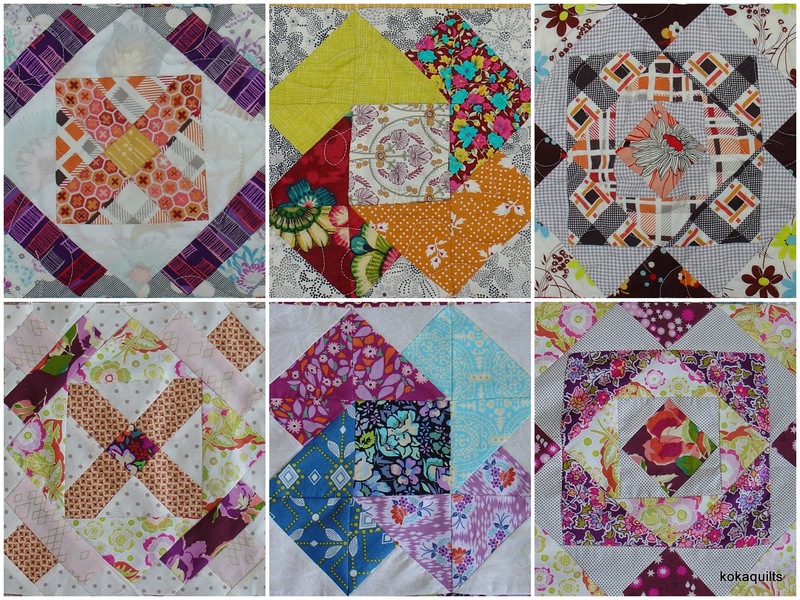 I mainly buy fat 1/4's, I figure that's a good way to get variety, and as I'm into scrappy quilts, variety is good. The problem arises when I need larger amounts of fabric for borders, backgrounds and dividing strips, like today! Things got a bit touch & go with the red & white microdot background fabric and the wasabi green linen- both of which I ran out of midflight. Still with this controlled pallette, a crazy mish-mash of old & new fabrics, a playful stripe, and lots of improv piecing, I got there in the end. It's quite a big quilt, approx. 170cms (68") x 200cms (80"), my usual spot on the deck for pics wasn't high enough, but you get the general idea. 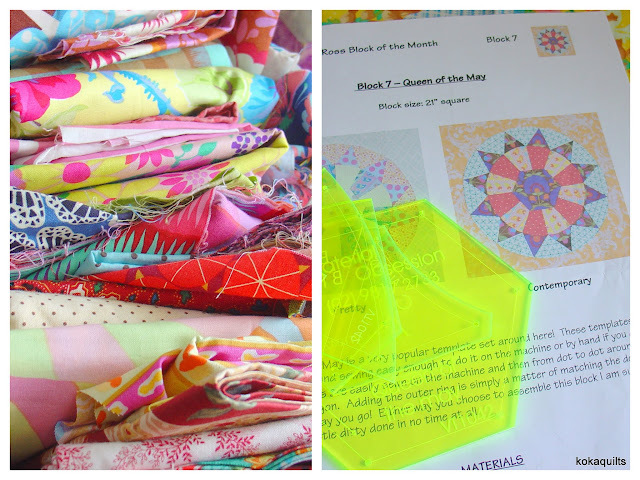 Love to hear how you decide just how much fabric to buy? Linking up with Cynthia over here for 'oh scrap'. it feels good to have a little finish! Pat-next-door is going to be a great grandmother in October and requested a 'pink' quilt. - and Evie had a little test drive this afternoon before we handed it over to Pat. 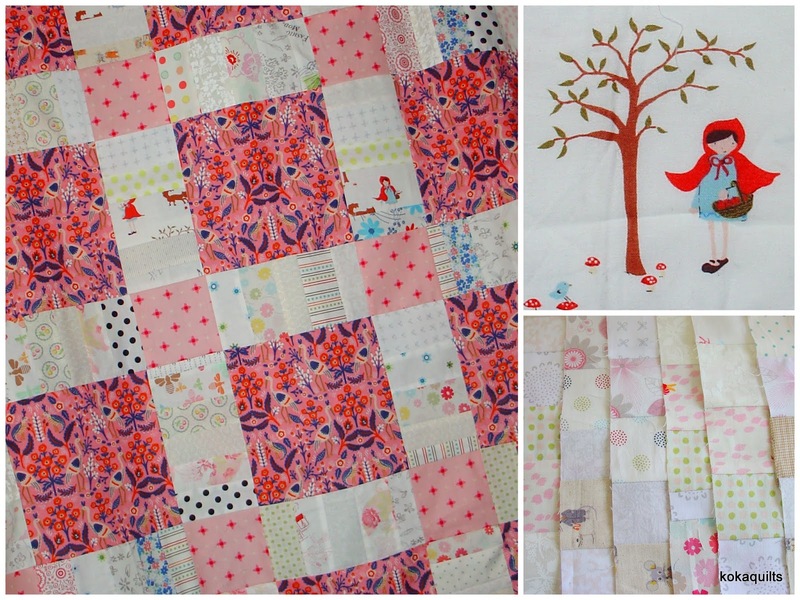 and a cute pink fabric from Andover Fabrics, Lizzy House for the smaller filler squares. and the binding was a blending stripe from my stash. Taking a break from sorting 'house' things and playing with fabric today. seems some serious sorting is required in here too! Hey wait a minute - is that part of a quilt under there? These zigzag blocks are in no particular order just yet. I've got a few more blocks to make as I want to have a 5 x 7 setting, so there's still plenty of wriggle room for a reshuffle. I'm also thinking about running the vertical darker colours into each other a bit more. 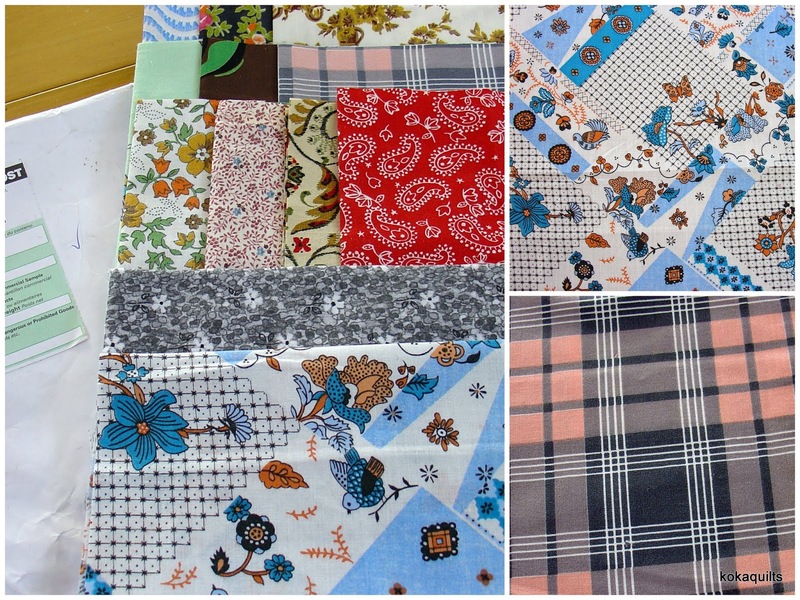 There's a mixture of Outback Wife fabrics and a few Anna Maria Horner ones. Loving the mix of these floral with stripes & checks, and I'm finding that repeating some fabric combos helps with calming things down! I've also made a bit more progress on my 'whimsy' blocks. I'm enjoying making these, just wish I could be enjoying it a bit more often. It seems to take me a least one block to get back into the swing of making them, what with those cheeky little inset seams and remembering to use a scant 1/4" as I piece them. but this next one is looking a lot better . . .
15 blocks so far, here's a group photo . . . I do love a little bit of vintage in some of my quilts, and so earlier in the year I signed up to the 'vintage fabric club' with Jen from apieceofcloth . My first package arrived this week and it's an interesting selection, very different to anything we get here in NZ. I'm looking forward to using them. - it's been great to see such a variety of projects. Things around here have got slightly diverted off course this week, are you not surprised? I started out with the best intentions, we are moving and my mission was decluttering & destashing. But it's always a risky activity when I start sorting scraps. Have a peep at what happened . . . Totally inspired by Lee Ann from niftyquilts, I have wanted to make a version of her 'tennessee lightening' quilt for ages now (see here), and have just been waiting for a bold floral to set the blocks with. her all-solids version of 'down a rabbit hole' . 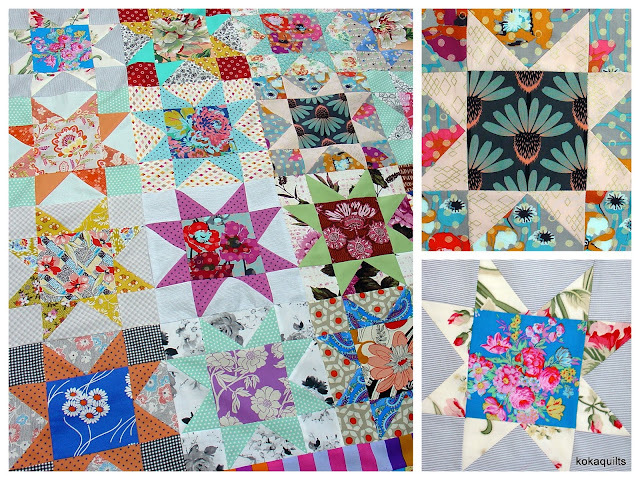 . .
She also has a few other great projects on the go too, like her Delilah blocks. 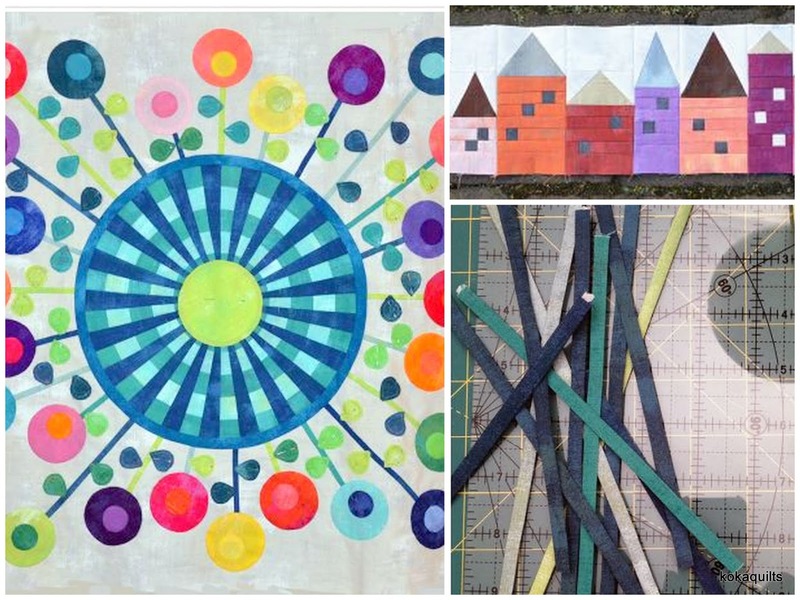 I love her mix of fabrics and quirky selection of low voloume backgrounds, look at #3 . . .
- pop on over here to see lots more & be inspired! It's a quick post today, as I've been busy packing up things. 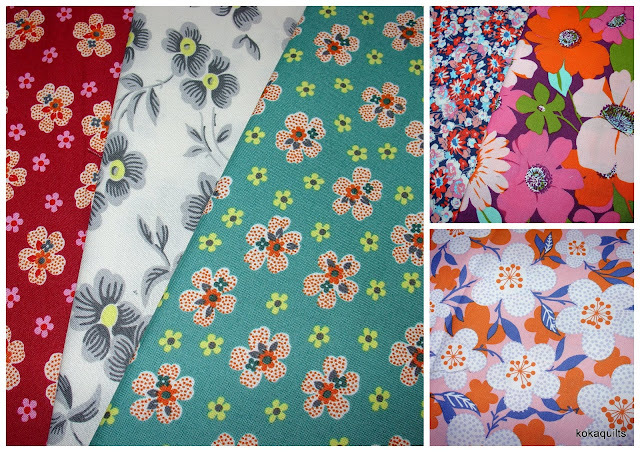 and so, in the absence of any sewing, I thought I'd share my recent fabric finds. They are a bit of a mixed bunch of florals . . .
and I'm sure these will fit in nicely with my latest WiPs too . . .
and the last one is from Josephine Kimberling, Daydream, Cherry Blossoms in Pink. Now to find some extra time for sewing! I think this is the first quilt I’ve ever made twice. 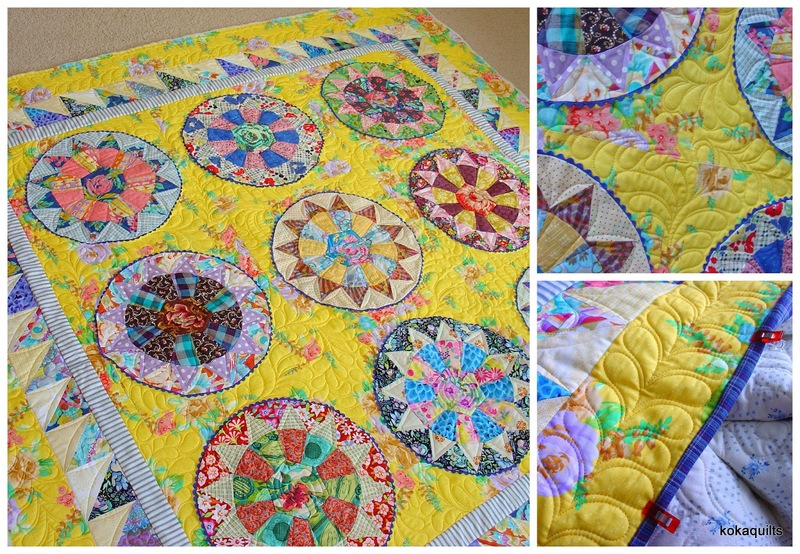 I was crazy mad in love with my first Gypsy Wife quilt. 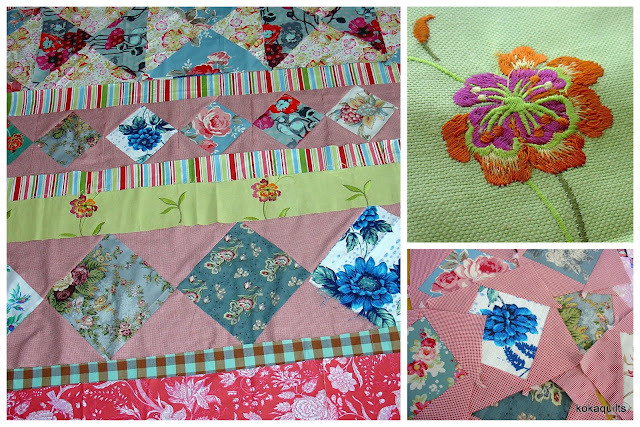 I had lots of fun chosing from a large number of scrappy fabrics, I ran lots of colour through my blocks and through my vertical rows, and I love everything about this charming vintage looking quilt. I loved it so much that mid last year, I thought I'd join Megan from jaffaquilts and make another one. I'd like to think the fabric choices I made about my new “wife” were different. I mean why bother making a second one if not to make it a bit different? There was lots of fussy cutting & scrappy colour still, but I felt it was more co-ordinated, more 'modern' looking. And all my vertical rows were to be in low volume greys & whites. I even had a focus fabric as my jumping off point, to guide my colour choices, something that had never occurred to me first time around! I made up all the first sections and then I'm not sure why, but with half the quilt done, I stalled. Fast forward to today . 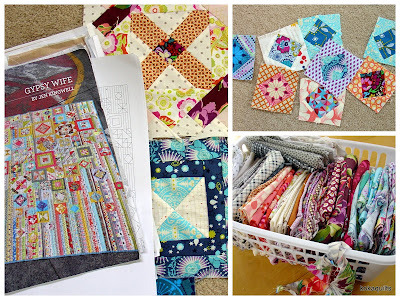 . . while decluttering the sewing room this weekend, I came across my GW #2, including all the little blocks, all pieced and all ready for making up section 6. I ironed everything and spread it all out on the design floor. including ideas about fabric choices & a colouring chart.